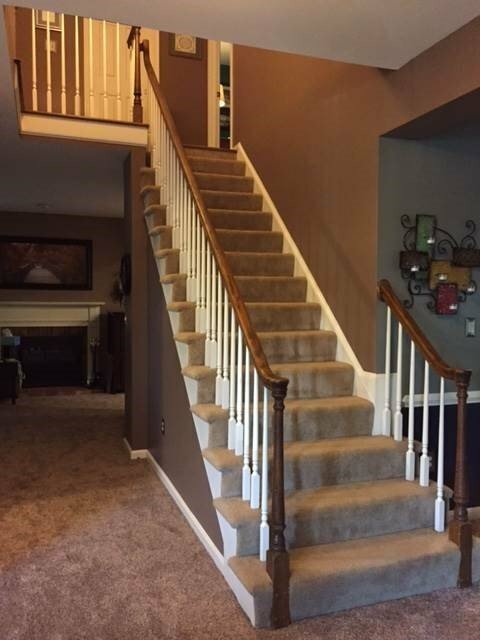 Loudoun Stairs also provides renovation services for those wishing to replace or restore or upgrade an existing stairway, balusters or rails. Tired of your old look? 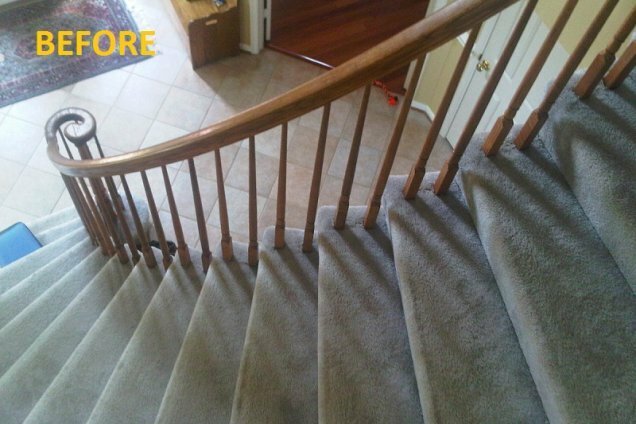 Let Loudoun Stairs remove and replace your old stair or rail system with a professionally-installed beautiful new and upgraded system that will add elegance and beauty to your home. 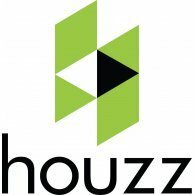 We can work with your contractors to provide turnkey design, selection, removal and installation or work with you independently if you are doing the job yourself. Watch a Loudoun Stairs stair renovation rip out. 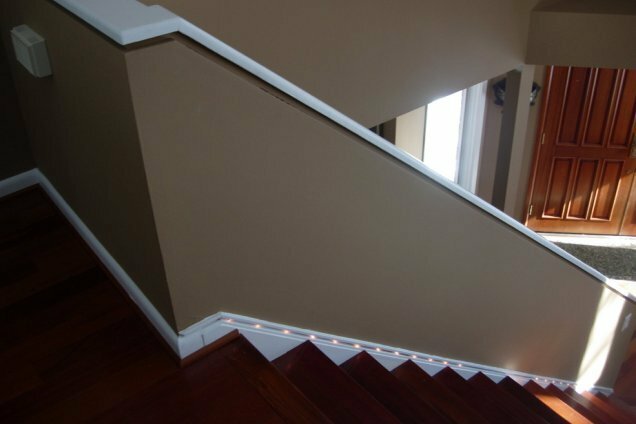 This customer wanted to replace their original, visually-obstructing Colonial-style rail system with a clean, contemporary look that would open up the rooms and stairs. 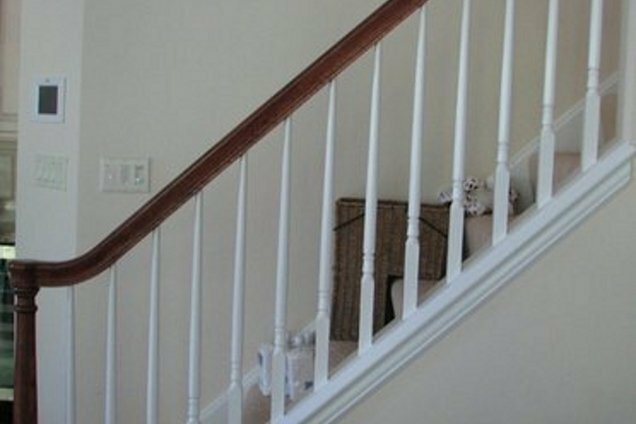 A post-to-post Colonial-style pine rake rail system with white lacquer newel posts and balusters on a stained oak plate, with a stained oak rail that turned at the top of the staircase. 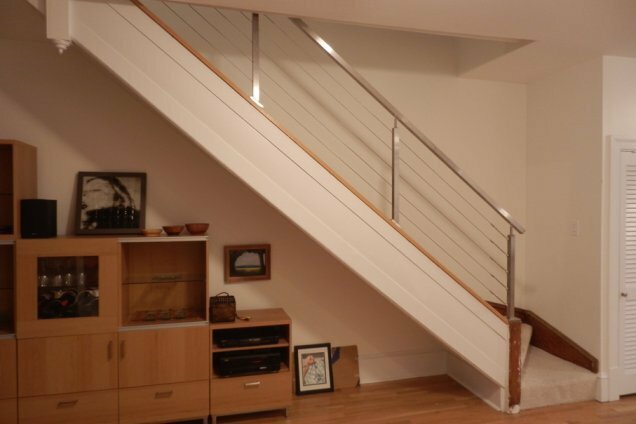 An over-the-post stainless steel cable rail system set to the stairs’ pitch degree, with square newels welded to base plates and securely mounted on a stained and finished oak plate. A cable system with stainless steel tension connectors was used in lieu of balusters. 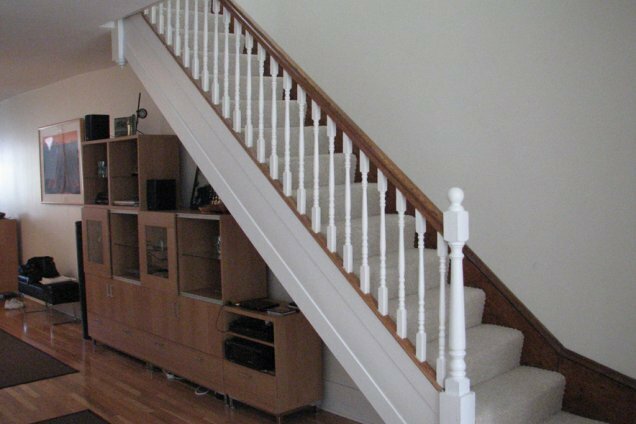 Considering it to be the focal point of the home, this customer wanted to upgrade their foyer staircase, taking it from a wood rail system to an oak tread and riser circular stair with a decorative metal baluster rail system. Carpet-grade circular foyer staircase with stained oak rail, starting with a volute on a stained oak newel on the bullnose tread, and curved to the radius of the stair. 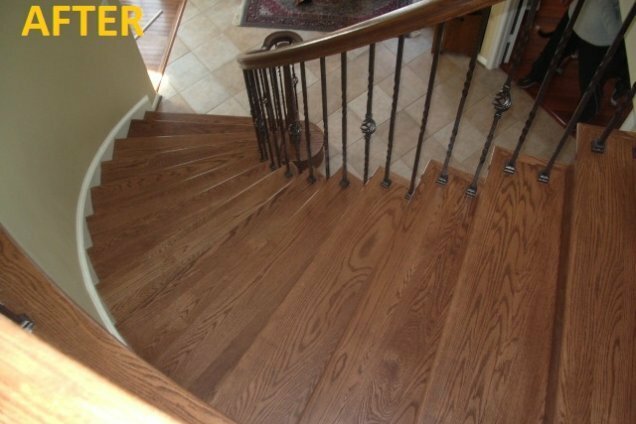 Supported by stained oak Colonial-style 5015 balusters and carpeted. Oak-finished tread and riser circular staircase with finished oak railing, with a volute on a stained oak starting newel on the bullnose tread, curved to the radius of the stair. 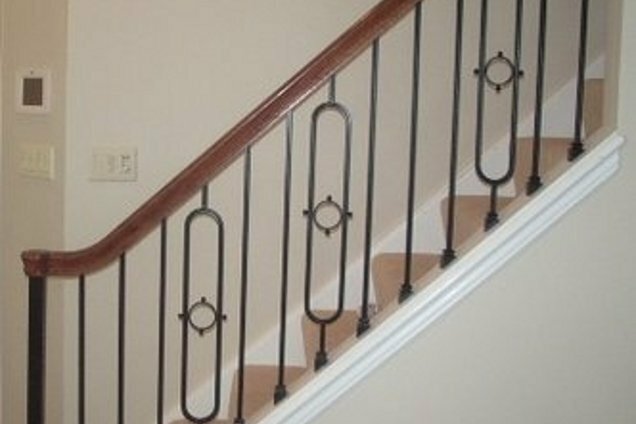 Supported by a metal baluster system with a single-basket pattern (a twist above and below the basket) and three twist balusters (double, single, double) between each basket baluster. This customer wanted to update all railing systems throughout the home, taking them from the white lacquered Colonial-style balusters to a custom medallion-style metal baluster system. An over-the-post wooden white lacquered 5015 baluster rail system on a boxed stair, set atop a white lacquered plate with oak-stained rail and starting newel post. Also a replacement of the balusters on an oak circular stair. Only the wood balusters were replaced, using decorative medallion-styled metal balusters with a varied alternating pattern between straight and medallion balusters. 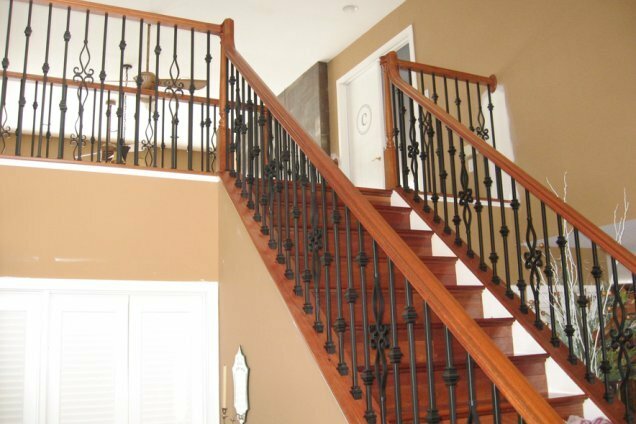 On the circular stair, decorative medallion-style and straight metal balusters were installed in a repetitive pattern of three straight balusters in between each medallion-style baluster for a stunning upgrade. 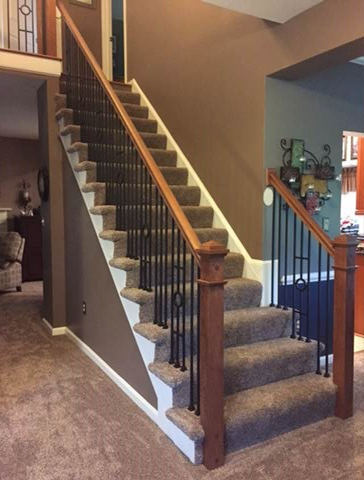 Removal of a solid knee wall that led up the foyer stair and into the second floor was top priority for this customer who wanted a metal baluster rail system that would add elegance and provide more light and views. A Brazilian Cherry boxed tread and riser stair system with solid knee walls in lieu of a balustrade system, capped with white lacquered plates. An over-the-post system with finished 6910 solid cap rail, 6 ¼” boxed flat pan newel posts, center newels, rail fitting, and 7” plates, all made from Brazilian Cherry. Custom Designer Series 5/8” satin black metal balusters were added in a repeating baluster pattern of double/single/double knuckle between fleur-designed balusters. The entry focal point looks more elegant and open, lets more light into the foyer and second story overlook areas, which makes the entire area appear larger.